This is my Iknitarod project (over on Ravelry, Iknitarod 2012). Figuring this may be the only way I’ll get this done, as it’s due for a baby shower in, oh, about a week! And yeah, I just started it. The yarn I’m using is Knit Picks Brava in a sport weight. It’s not as orange as it appears in the picture, it’s more of a coral. 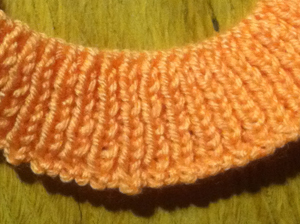 this yarn is, by far, the nicest, softest acrylic I’ve worked with. 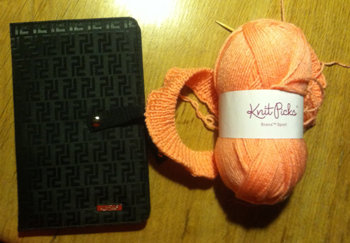 Also, I have Knit Pick’s way cool Chart Keeper to help me keep track of my designs after I get that far. I know I should round it out and knit this puppy on my Knit Picks Harmony needles, which are my absolute favorite needles to knit with, but they are busy over on several other projects. To the right you can see how much I got done last night – the ribbing on the sweater. Now to change over to the Size 7 needles and start flying. Should go pretty fast, little bitty knit, on big (relatively) needles. THIS Eskimo (and former Alaskan) totally approves! Beautiful. Just joined this group last night after I read the post here. First time for me doing anything like this! I’m thinking about doing a lace shawl. That is going to be a challenge for me! Who knows if I will finish it in time, but I’m going to try 🙂 Happy knitting! See you on the trail!